Footsteps in footstep_planner are represented by a center of a rectangle. 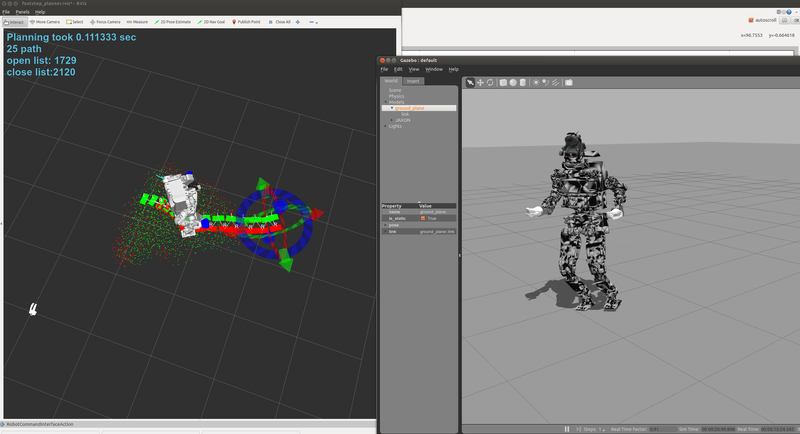 Footsteps in footstep_marker are represented by end-coords of robot model. [jsk_footstep_planner/config/*footstep_planner_params.yaml] Update HRP2JSKNT, HRP2JSKNTS footstep planner params and add parameter for JAXON. [jsk_footstep_planner/test/test_footstep_planning_eus_client.test] Increase test time to 5 minutes. [jsk_footstep_planner/euslisp/generate-footstep-planner-parameters-from-robot-model.l] Use analysis-level coords while IK. [jsk_footstep_planner/test/test_footstep_planning_eus_client.test,.l, config/sample_robot_footstep_planner_params.yaml] Add test for footstep successors and add config parameter for euslisp sample robot. Make default tested robot as sample robot. [jsk_footstep_planner/CMakeLists.txt,package.xml] Add footstep planner rostest. roseus dependency is required for message generation. [jsk_footstep_planner/config/HRP2JSKNT*_footstep_planner_params.yaml] Add hrp2 footstep planner settings. [jsk_footstep_planner/config/JAXON_RED_footstep_planner_params.yaml, launch/cppplanner/optimistic_footstep_planner.launch] Move some footstep parameters to parameter files. [jsk_footstep_planner/src/footstep_graph.cpp] isColliding returns false if use obstacle model is true and no obstacles are specified (point cloud size = 0). [jsk_footstep_planner/launch/cppplanner/footstep_planner.rviz,optimistic_footstep_planner.launch] Enable use_obstacle_model and display obstacle model as point cloud. [jsk_footstep_planner] Do not use jsk_pcl_ros, use jsk_recognition_utils instead of it. These commits are forgotten in previous commit. [jsk_footstep_planner] Re-implement footstepHeuristicStepCost in computationally-efficient way. Do not use Eigen::Affine3f::rotation because it calls SVD internally. 2. Do not cast to Eigen::AngleAxisf, just use cos(w/2) to compute angle from quaternion.